You can get a 16×20 custom canvas print from Canvas People for only $37 plus they are offering FREE shipping with a guarantee it will be here by Christmas! Head over to Canvas People and check out this one day offer! Offers Dec 9, 2011 in CanvasPeople, holiday, photos · Expired! Canvas People has a Black Friday deal perfect for the holidays. They are offering a free 8 x 10 photo canvas (just pay shipping) OR you can get $55 off any size as a special introductory deal! The sale just started and you don’t have to wait to get this deal. I’ve told you many time how much I love these prints. The quality is great and they make perfect gifts. Head over to Canvas People and see this great offer. 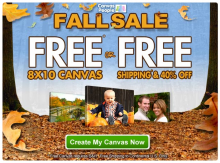 Canvas People: FREE 8×10 OR 40% Off PLUS Free Shipping! I heard this offer is going away very soon! If you think you are going to want to get one, don’t wait! Canvas People has another really great offer going on right now. They are offering a free 8 x 10 photo canvas (just pay shipping) OR 40% off any larger canvas and free shipping. These are really cool if you’ve never seen them. All the “grandparents” get one every Christmas. It’s such a great gift for many occasions plus it’s really easy to order. Have you ordered a canvas print? Send us a picture so we can see! I’ll get a picture from “grandma” to show you how cute ours turned out last year! Wow, the Canvas People offer is back and it’s a great one. Right now you can get a free 8×10 or $50 credit. Just pay the shipping. 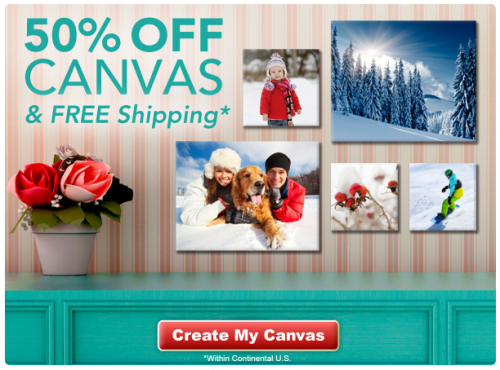 Plus, get 50% Off a second Canvas and 50% off shipping. Head over to Canvas People to check out this awesome deal. These photo canvases make great birthday, anniversary, and graduation gifts as well. We’ve been giving these to our “grandparents” for Christmas every year! Always a hit! 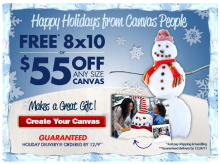 Hurry, there is still time to get your Canvas People offer before the holidays! Canvas People is offering every new customer $55 credit towards their first canvas purchase. That means you can get an 8 x 10 canvas for free! You will have to pay $14.95 for shipping and handling. I love these. We are getting our photos done again for Christmas and can’t wait to get another one! Get your free 8 x 10 from Canvas People here! EXTENDED! Canvas People: Black FridayÂ 50% off plus FREE shipping! This offer has been extended until Dec. 3rd! This is by far one of my favorite gifts to give. These canvas prints are beautiful and make a great addition to any home. 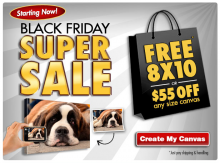 Right now you get 50% off of Photo Canvas’s at Canvas People with the coupon code: blackfriday at checkout! Plus, they are offering FREE shipping! Offers Nov 27, 2010 in BlackFriday, CanvasPeople, family · Expired!